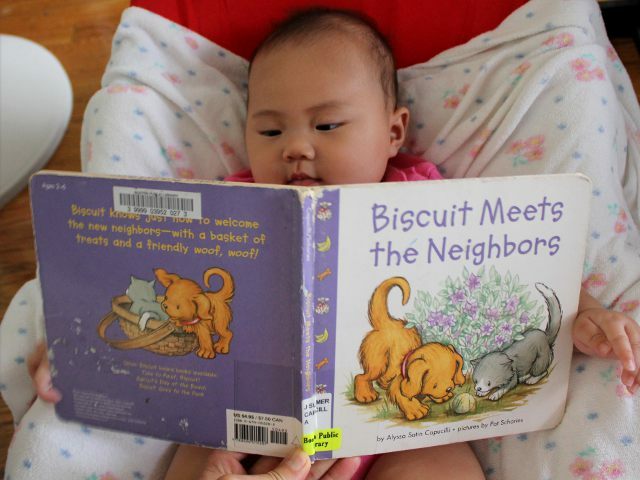 With an adorable front cover, Biscuit Meets the Neighbors by Alyssa Satin Capucilli stood out on a crowded display of baby books at the library. The cover, designed in multiple shades of purple, shows a cute, yellow dog and a cute, grey cat staring at a baseball in front of a flower bush. The drawings by Pat Schories set the tone for the entire story. The plot involves a little girl, the dog, and the cat watching neighbors move in. As the girl prepares a gift basket for her new neighbors, the dog and cat embark on mischief. The girl, dog, and cat eventually meet the neighbors and make new friends. The plot is cute and the story is ideal for a children’s book. Despite being a little naughty, the pets don’t do anything really bad and the girl shows responsibility throughout the entire book. My one complaint about the 16 page book is that the author assumes a reader is familiar with the characters. Since Biscuit Meets the Neighbors is part of a larger series of books about Biscuit, Capucilli never introduces the dog and cat by name. In the first page the little girl calls out to them, “Look Biscuit! Look Daisy!” with no indication of whether Biscuit refers to the dog or cat. However, since the animals reply, in order, “meow” and “woof, woof”, I spent the entire book telling Arya that Biscuit was the cat and Daisy was the dog. The illustrations are consistently high quality with the faces of all the characters being particularly adorable. Arya really liked looking at the pages where the little girl’s face was fully visible. I liked the picture where they finally meet their neighbors. I’m certainly interested in the full Biscuit series now that my daughter enjoyed this book. Given the large, colorful pictures and simple, interesting text, Biscuit Meets the Neighbors is appropriate for a wide age range from young babies through children in kindergarten. School-age children who are anxious about meeting new neighbors would definitely respond well to the book. Biscuit Meets the Neighbors is no longer in print. It costs (including shipping) $4 used from Amazon.